People usually have pretty strong reactions to the color red, they either love it or hate it. It was actually quite enlightening to read about the psychology of the color red. I found out that if I were any color it would be red. Red is the color of physical movement. It excites emotions and motivates us to take action. Negatives...aggressive, domineering, angry, quick tempered and intolerant...all me. So now do you see why my feelings are mixed? There's a lot to love and a lot to hate. 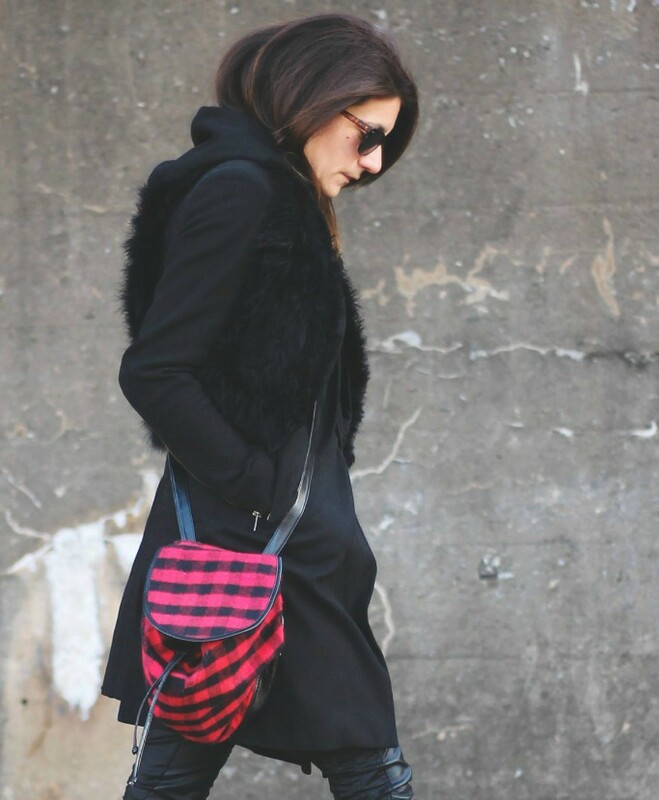 This entry was posted on Thursday, December 12, 2013 and is filed under black,plaid,prints,red. You can follow any responses to this entry through the RSS 2.0. You can leave a response. But since you can relate to the positives and negatives, I can imagine you have a difficult (maybe even love-hate relationship) with red..
Red is totally my personal mood booster! i think you know my feelings about the color red…..which is why i lurveeeee this ensemble. those vintage shoes are like heaven in a shoe form and obviously loving the monochromatic black…..perfection upon perfection! You look so amazing. These pants make your legs look super long and skinny! Love the red shoes too. I once heard that wearing red makes you stand out from the crowd, I love it and wear it all the time, who wants to blend in?! Have I told you how much I love your blog? I found it only a couple of weeks ago and you inspired me to go out and look for a great vintage piece of my own and I found a fantastic pink jacket with 3/4 sleeves and violet flowers all over the jacket! So thanks to you for that. The color red - did you know that the color red increases appetite? That's why you see red in many restaurants, think Chinese restaurants. So, that makes me a red color too, if I were a color. Actually red has always been my fav color, ever since my parents let me decorate my room and I chose red shag carpet and pink walls. Oy! I've always been a bit intimidated by reds, especially since, like you mentioned, they can sometimes be associated with aggression. It's pretty obvious from just thinking about the marketing on Valentine's Day alone, though, how we mainly choose to see the color of red: as an aspect of romance. There are so many psychology studies out there concerning how we perceive red and romance, as well as why we actually find others more attractive when clad in red (which may be more related to biology). To be truthful, I'm always in awe of women who can wear red. I really do think it shows their confidence and wonder if the red they're wearing is what's maybe upping their confidence. Haha. Red is a great color, and I happen to like being around strong and assertive women ;) Great look!